A process-oriented approach that gives students a chance to learn and practice the real-life skills of collaboration and conflict-resolution skills. Includes 98 activities, some of which use the low and high challenge course. 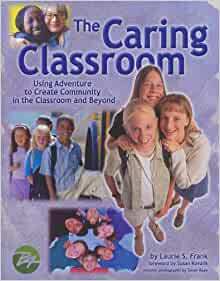 This book provides a guide for teachers that is packed with activities and information to help facilitate the growth of community in the classroom. Laurie Frank is a former public school teacher who has worked in the Adventure field for 20 years. In the many years she spent in the Madison, WI, public schools, Laurie was a leader in designing the curriculum for the nationally recognized Stress/Challenge Adventure program. Laurie is a Certified Trainer with Project Adventure and has been since 1990. She is also very active in Play for Peace, an organization that focuses on bringing children of conflicting cultures together through play. The Association for Experiential Education honored her with the Michael Stratton practitioner of the Year Award in 1997.